If these stay near Santa Fe XL pricing they're gonna sell a load of these. Vince, I usually agree with you on your comments but not this time. you know well this Hyundai uses less chrome than any others US (or Lexus) SUV/truck designs. Do you have some kind of agenda against Hyundai? I like the interior a lot. Not sure about the exterior, I would have to see it in person/metal but at least I hate how the huge metal grille looks. I’m not even sure he likes automobiles. He swears everything is ugly. Monstrosity or not, that grill still looks far better than Lexus design. I think this is rock solid! So original, in a sea of look-alikes out there, this is stunning. Upscale, tough and refined. That interior is best in class, period! The front seems a bit too busy and loaded. It must be the close up. He sure loves volkswagens though. I find it quite handsome inside as well as out! Hyundai Palisade will be the top seller I predict in this segment! There are some exceptions... But this sure isn't the "Golden Age of Automotive Design." The monstrous, horrendously ugly front grilles on so many current vehicles will NOT be fondly remembered 20 years from now. Grotesque (to say the least). Does anyone really feel these designs are attractive?? And how come they seem to be everywhere now? And getting even more bizarre with each new model?? Someone PLEASE tell them to stop this!! I am strangely drawn to this vehicle even though there are several things that I don't like about it (unconnected chrome over the doors) and it looks like other cars that I find offensive. I keep wanting to go back and figure out why I don't hate it, but each time I go back I like it a little more. "Monstrosity or not, that grill still looks far better than Lexus design." That's not saying much. Lexus designers are amateurs. 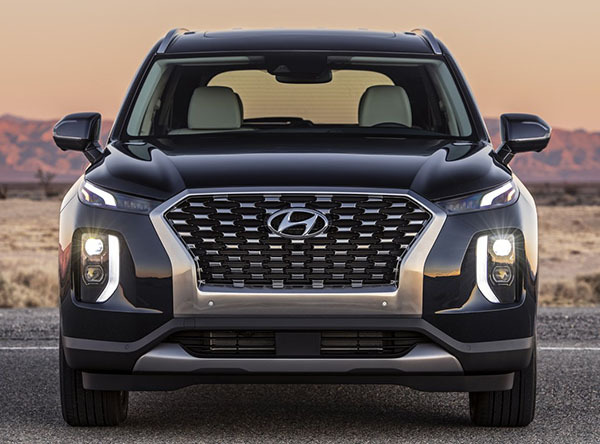 This isn't great, but Hyundai hasn't committed to this dumpy design for all of their vehicles. YES. They HAVE committed to this dumpy design for all their vehicles. They have ruined all of their cars with this disgusting new grille shape. It was a nice, well proportioned hexagon up until the past year or so. Now ALL of their vehicles flair out or straighten-down the lower edges of the grille. It is terrible. It has no reason to flair out. Nothing responds/informs the flair out. It's a Lexus wannabe bur worse (like the first GS that used the predator face). There is a lot of chrome (not inherently bad), but this application here is so so dated. It's flat, clunky, and overwrought. The insert on the tail lights is plain bad. Just look at Mazda for a beautiful way to use it. The design industry is (and has been) moving towards informed and three dimensional forms. Not arbitrary flat detailing (also look at how Lexus has improved their grille to be better integrated and flowing/impacting with the rest of their front ends). Not great, but still miles ahead of anything GM has out right now. Not really digging the exterior design. I appreciate the fact that Hyundai was brave enough to try something different, but the attempt at distinctiveness went terribly wrong. The chunky shapes and heavy handed details just don’t appeal to me. We’ll see how this exterior design plays out with the buying public. It will either draw positive attention and results to the brand because it did try some unique styling elements on the exterior design or we’ll see a massive mid cycle restyling because the initial exterior design underperformed in the marketplace. It will definitely be interesting to see how this plays out with a family oriented vehicle in a hot segment. The interior appears to be a very pleasant place to be, even if the exterior is less than desirable to behold.